Serpent worship is an integral part of Hinduism. There are several serpent gods mentioned in the mythology. Lord Karthikeya (Subramanya) is considered as the Lord of all Serpents. Hence, in many shrines Lord Subramanya is worshipped in the form of serpent. Ghati Subramanya near Bengaluru is one such temple where Lord Subramanya is worshipped in the form of a seven-hooded snake. Ghati Subramanya is around 60km from Bengaluru (Bangalore). It is situated in Doddaballapur of Karnataka. One can go via Yelahanka-Devanahalli Road to reach Doddaballapura. The temple is about 15km from Doddaballapura to Ghati Subramanya temple. According to the mythology, Lord Subramanya performed a penance at this place in the form of a serpent. During this time, he got to know about a Naga (serpent) family who were threatened by Garuda. So, he prayed to Lord Vishnu and requested him to stop his vahana (Garuda) from harming the serpent family. Therefore, both Subramanya and Vishnu manifested themselves here. We can see the idols of Lord Subramanya (seven-hooded serpent) and Lord Vishnu in the main sanctum. Here Lord Karthikeya is facing the East and Lord Narasimha is facing the West. So, a mirror is placed above the sanctum to help the devotees see both the idols in the sanctum. 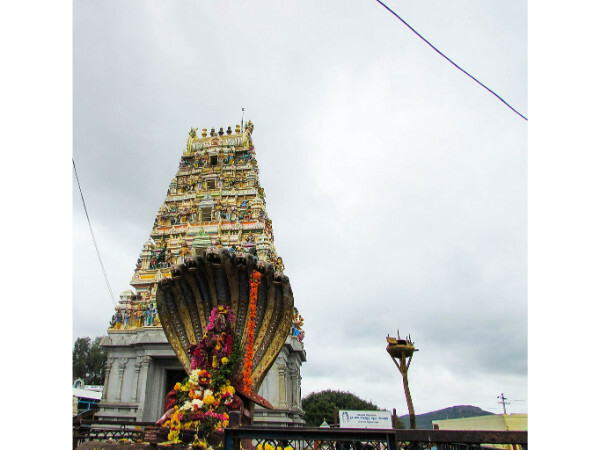 Hence, Ghati Subramanya is famous for serpent worship as well as shrine for Lord Narasimha. This is one of the most interesting facts about Ghati Subramanya that will amaze us. People offer milk to a snake mound located opposite to the temple. There is also a big statue of seven-hooded serpent and the idol of the god opposite to the entrance of the temple. Originally the temple is said to be constructed by Ghorpade Rulers of Sandur. Later it is said to developed by other rulers. The shrine is built in the style of Dravidian architecture. The temple complex consists of the main temple and also a place for naga prathistapane (where you can see many serpent idols installed by the devotees). Nagara Panchami and Narasimha Jayanti are some of the main festivals in the temple. The Pushya Suddha Shashti is the one of the biggest annual festivals when a fair also happens in the temple premises. Ghati Subramanya is around 60km from Bengaluru. There are direct buses from Bengaluru to Ghati Subramanya. Doddaballapur Railway Station is about 16km from Ghati Subramanya. Tourists can take share autos or buses (KSRTC) to reach the temple. (Note: As of now the roads are under construction and the joureny is slow because it is single line everywhere till Doddaballapur. The 15km stretch from Doddaballapur towards the temple is an easy drive as the roads are in the good condition). Ghati Subramanya Kshetra is one of the top temples in Karnataka. It is also one among the famous serpent temples near Bengaluru (Bangalore). Dosha nivarana poojas like sarpa dosha and nagara prathistapane is also done here. Ghati Subramanya is around 2-hour drive from Bengaluru. So, it is also good for picnics as you get to enjoy the rural side of Karnataka.